FOR six centuries, they lay hidden, their secrets buried within the unblemished sands of the Outer Hebrides. 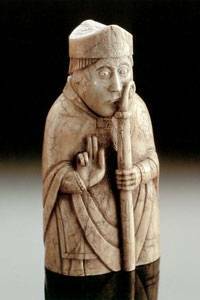 Now the fate of the ancient Lewis Chessmen deemed one of the greatest artefacts ever found in Scotland has become the latest subject in Britain's cross-border political war. First Minister Alex Salmond will start 2008 with a high-profile campaign to 'repatriate' 82 of the beautiful figurines back to Scotland from their current home in the British Museum in London. The priceless relics were found on a beach near Uig on the Isle of Lewis in the early 19th century. Historians believe they were probably made in Norway in around 1200AD, and were originally bound for Ireland. But having spent most of their lives buried in Scotland, Salmond insists they should all be returned here. Last night, yet another clash between his Government and officials in London was looming, after the Department for Culture in London said it had no plans to allow the pieces to be sent to Lewis on anything other than a temporary basis. The chess pieces are exquisitely carved figurines of seated kings and queens with distinct features, bishops with mitres on their heads and knights mounted on horses. Their distinctive style was copied for a scene in the film Harry Potter And The Philosopher's Stone. It is thought they were discovered by a local shepherd sometime before 1831, after he stumbled on a small stone chamber about 15ft beneath a sand bank, in which the chessmen were protected. They were first exhibited in Scotland soon after, but were then quickly split up. Of the 93 pieces, 10 remained in Scotland, while the rest were donated to the British Museum, where they remain. Another piece has since been added to the Scottish collection, all of which are currently displayed at the Royal Museum in Edinburgh. Now Salmond wants all the pieces to be reunited north of the Border. In a speech to Gaelic campaigners last week, Salmond said: "I find it utterly unacceptable that the Lewis Chessmen are scattered around Britain in a bizarre parody of the Barnett Formula. And you can be assured that I will continue campaigning for a united set of Lewis Chessmen in an independent Scotland." A source close to Salmond said that the First Minister and his team will step up the campaign in coming weeks. He added that plans were being drawn up for the next move in having the priceless relics returned to Scotland. The source said: "We will take this further in the New Year. We are working on a series of options. We think this is an important matter, because they should be back where they belong and they could be a boost for the Western Isles economy." The move has been backed by locals in the Outer Hebrides, who believe that the Chessmen could be a valuable tourism money-spinner. Traditional industries such as fishing, tweed and oil-rig servicing have slumped, and the population has shrunk to 24,000, from more than 30,000 20 years ago. Locals have also hinted that they might settle for something less than all the pieces being in the Isles, or even in Scotland. Alex MacDonald, convener of the islands council, said: "We welcome this move by Alex Salmond, and it is very significant for us that the First Minister believes that the Chessmen should be returned to the islands. My preference would be for some to be in Edinburgh, some in Stornoway (the islands' capital] and some in Uig, where they were originally found." Annie MacDonald, a campaigner for the return of the pieces and a councillor for the area of Lewis where they were found, said: "We should have the Uig Chessmen here where they were found. I know they probably originated in Norway, but they were found here and it is because of here that the world knows about them. They would be great for tourism." But Whitehall has given no sign it will budge in allowing the whole set north of the Border for anything other than an occasional short-term display. A spokesman for the Department for Culture, Media and Sport said: "By Act of Parliament, the British Museum is forbidden from disposing of any of its assets, and to change that would require primary legislation. We have no plans to do that." A source added: "The key pointer in this context is that this is the British Museum. That means that it is the repository for items for the whole of the UK. That might not suit Mr Salmond, but that's it." No one at the British Museum was available for comment.